Close your eyes and picture the most successful law firm you know. The image is quite clear, right? Dark, wood-paneled walls, volumes of scholarly legal tomes lining the walls, men and women in dark suits and freshly-shined shoes traversing the halls at breakneck pace, striving to get more out of their 100-hour week than is seemingly possible. Now open your eyes and take a look at the most successful new real estate law firm in Arizona, MacQueen & Gottlieb. Please note the differences, which are dramatic both in number and degree. The office space is open, bright and airy. There is rarely a necktie to be found. The partners are young (MacQueen is 40, Gottlieb 33). And most importantly, the attorneys, legal staff and support team move about the office doing what many in the industry thought was merely a myth in a successful law firm – smiling. That culture and the skills of named partners Patrick MacQueen and Benjamin Gottlieb are what have propelled this dynamic young firm to the top of the list of best real estate firms in Arizona in just its first two years. The firm celebrates its 2nd anniversary this month, and the partners are quick to point out that they believe the atmosphere they have created is just as responsible for their success as the skills of the attorneys. Make no mistake, this culture is no accident – MacQueen and Gottlieb set out to make their firm this way when both left larger, more “traditional” firms to start their own. While Gottlieb and MacQueen shared the goal of having a loose, easy-going culture when they started the firm, the partners definitely do not have the same personality. However, they both have the ability to put the firm’s other attorneys and staff at ease and create a mood that encourages interaction among all levels of the firm. Of course, a unique culture and lighthearted atmosphere around the office is great, but it doesn’t mean much unless the firm is getting results for its’ clients. And that is the other area in which MacQueen & Gottlieb excel. – The firm was retained by Dunn & Gibson out of New York as their local counsel in a $180 million transaction. Another hallmark of the firm’s first two years has been explosive growth. Both Gottlieb and MacQueen acknowledge that the firm’s culture has been a factor in that growth. The firm has grown about 350 percent, from four to 14 people, and now boasts five attorneys with a sixth having passed the bar and awaiting licensing from the state. According to Gottlieb, the firm’s growth is likely to continue – MacQueen & Gottlieb currently is once again looking to hire more attorneys. “I’d like to see us add two to five attorneys a year for the foreseeable future. I’d see that as a very manageable level of growth for us,” Gottlieb said. So, to recap, in its’ first two years MacQueen & Gottlieb has created a culture unique in its’ industry; successfully argued precedent-setting legal cases in the highest courts in the state; and has grown 350% and is looking to continue that trend. That doesn’t sound like a “traditional” law firm at all; and perhaps that’s why they have enjoyed such unprecedented success in such a short time. MacQueen and Gottlieb formed M&G to create a different kind of firm that uses state of the art legal software and technology combined with award-winning legal minds to provide the best real estate representation available. 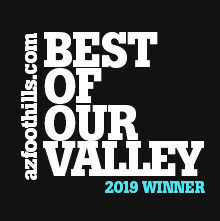 In a reflection of that commitment, the firm was voted the #3 real estate law firm in Arizona in the 2018 Ranking Arizona survey in just its first year of practice. In addition to real estate law, the firm also offers services including litigation, business law and estate planning. M&G is located at 2 N. Central Ave., Suite 1800, Phoenix, AZ 85004. Contact the firm at (602) 533-2840 or visit them on the web at www.MandGLawGroup.com.